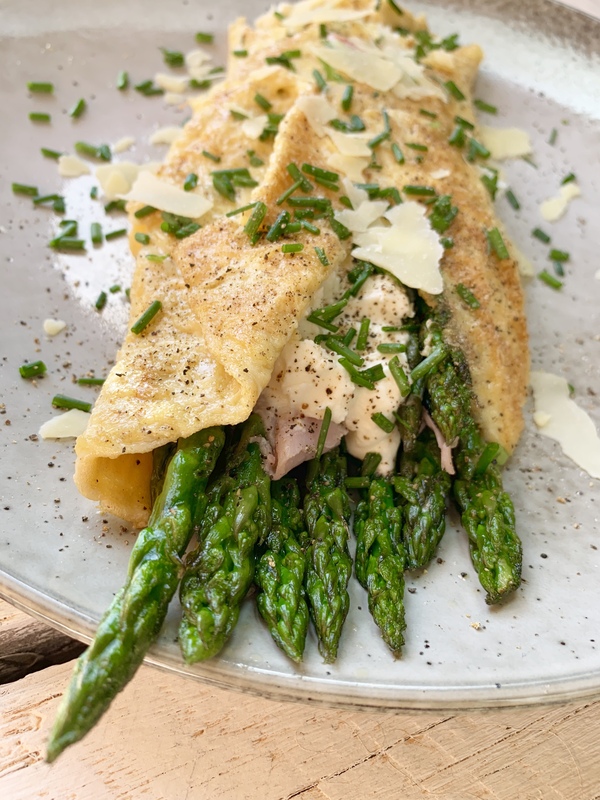 Light fluffy eggs, gooey melted cheese, crisp green asparagus and smoky bacon combine to make an omelette that is delicious any time of the day. It is perfect for a leisurely weekend breakfast when you have a little more time to cook, or an easy weeknight dinner – just add a simple dressed salad and a chunk of buttered sour dough bread. Lightly fry asparagus in a non-stick frypan in olive oil until it is tender. Remove and set aside. Beat eggs lightly and season with salt and pepper. In a medium sized frypan melt butter until sizzling and add eggs, swirling around the pan until a large circle shape forms. As the omelette starts to set, use a spatula to gently lift away from the edges. Cook for about 2 minutes until the underneath is golden and top is still soft. In the middle of the omelette layer with asparagus spears, shaved ham and large dollops of ricotta cheese. Fold each side in to the middle and cook for another minute or so. Serve on a large plate topped with fresh chives and parmesan cheese. Enjoy! Wow. Beautiful as well as tasty.